Compared to last Tuesday, this one was light in terms of the polling traffic. 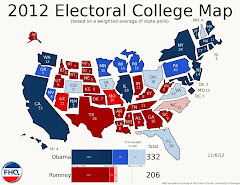 There were seven new polls from five states and the take home message seems to be that Obama is consequentially stretching his leads in some of the toss up states. Well, if there is an antithesis to the statement that Obama is stretching his leads, Arkansas is it; quick with a rebuttal. Then again, the Natural state has never been viewed as one of the more hospitable states for the president. 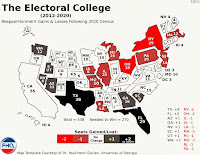 In fact, statewide, it was one of the few states that became redder in 2008 as compared to 2004 when most of the rest of the country was swinging to the left. It wasn't that long ago that Democrats were competitive on the presidential level in Arkansas. Clinton obviously did quite well in his home state, but both Gore and Kerry kept it in the ballpark. Obama didn't in 2008 and doesn't look to be improving on his showing there in 2012. FHQ does not want to frontload the comments reserved for Nevada and Ohio, but some of it applies to Florida as well. The Washington Post poll is an example of Obama stretching his lead on the state level. Sure, there have been +4 Obama survey results, but that type of spread is becoming more commonplace post-convention. That has taken the FHQ weighted average -- at one point just +0.04 Obama -- and widened it nearly to the point of coming off of the Watch List. As we have said many times in this space, it is the consistency of the polls that has to be the most troubling to the Romney campaign. Both Nevada and Ohio had a couple of polls released today and the picture was largely the same. Intra-state the two polls cancelled each other out. While one seemed to point toward Obama increasing his advantage, the other showed a much tighter (or tied) race. In the case of Nevada, there have been six polls conducted and released in the time since the conventions. Three have shown an Obama lead of seven points or more and the other three have indicated a race that is close to if not within the margin of error (for many of these polls) at three points or less. Part of that is simple polling variability. But part of it is also the fact that the greater than seven point polls just weren't there before; not in as great a number anyway. After seeing the gap close in Nevada to the point that it almost slipped off the Watch List deeper into the Toss Up category, the FHQ weighed average has begun to climb again toward the Lean Obama category. New Jersey is like Pennsylvania only slightly bluer. The numbers continue to come in rather consistently in the low double digits. The Garden state simply is not competitive this time around as it has occasionally threatened to be in the not too distant past. See Nevada, but with the caveat that there are comparatively more polls in Ohio. There have been eleven post-convention polls conducted in Ohio. The president has led all eleven of them, but has led six of them by four or more points (five by more than 5 points) and held the advantage in the remaining five polls by three points or less. In the Buckeye state, as was the case in Nevada, the weighted average has begun to climb, but only slightly and always between three and four points. The slow move is attributable to both the number of overall polls and just how great the leads are in the president's favor. That said the trajectory that the Ohio average is on is pushing it ever closer to the Watch List, only not in a direction that would not bring it closer to Romney. Instead, the average is moving closer to the Lean Obama area. 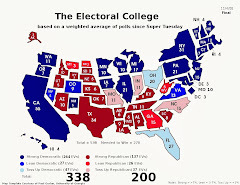 Nothing changed on the map today, much less the overall tally of electoral college votes. The same is true on the Electoral College Spectrum as well. Outside of the new polling data in Arkansas pushing the Natural state much deeper into the Strong Romney category -- into the far right column -- all of the other states where new data was introduced held their positions. 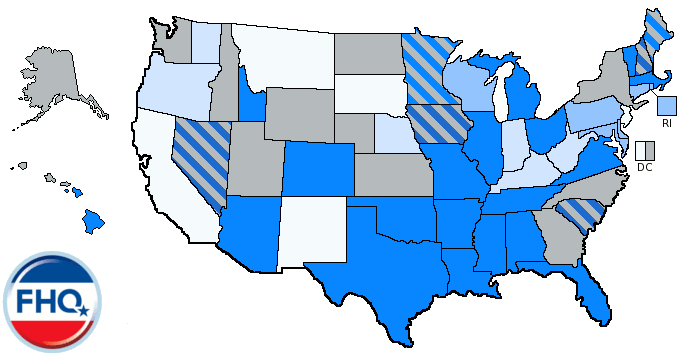 This election still very much hinges on that small group of states in lighter shades of blue or red and maybe Wisconsin. The playing field is very narrow and the margin of error for the challenger is very small indeed. The Watch List remains the same as it was a day ago, but with the footnote that Florida is within one one-hundredth of a point of coming off the list; ending up deeper into the Toss Up Obama category. Similarly, Nevada is making a push, after contracting some, toward the Lean Obama category. Both continue to be on the list for now, however.